When talking about ductile iron pipe in sewer applications, many times Induron’s Protecto 401™ comes to mind. Protecto 401 lining has often been the specified lining for ductile iron pipe in sewer applications more than 50 years. Common uses for Protecto 401 are for a sewer force main that may not be fully running, where trapped air may exist, where chemical resistance is required, or for abrasion resistance. There may be occasions in the field when patching of the Protecto 401 lining may be necessary. Much time, effort, and care have been expended installing a water line. Crews have worked through inclement weather. Unexpected rock was found, which slowed progress but did not stop installation of the pipe. Crews have worked long hours to meet deadlines and are anticipating the end of the project. But wait, you have not pressurized the line. All eyes are on that gauge in hopes of validating the work was successfully completed. The following article was recently featured in McWane Ductile’s Modern McWane magazine and tells of one water professional’s experience when faced with what could have been a catastrophic event, and the decisions he made to resolve a very large pipeline problem. As a general or mechanical contractor, you want to know the piping materials for your job are fabricated to meet or exceed project specifications and delivered in a timely manner. McWane Ductile-Ohio has a dedicated Treatment Plant Division providing specialized Design-Build services to support your project from concept to final buildout. Our team provides pre- and post-bid services to ensure your projects are completed on time and on budget. What Is The Recycled Content Of Ductile Iron Pipe and Why Is It Important? In today’s world, we all recognize the need to be concerned with our environment and natural resources. We all realize that these things are limited and not self-restoring. We now have several generations that have always had recycling and environmental awareness in their lives. This post drills deeper into the question What is the Recycled Content of Ductile Iron Pipe and Why Is It Important? Why Use V-Bio® Polyethylene Instead of Standard Polyethylene Tubing? The more than 75 years of ongoing research on iron pipe corrosion and the use of polyethylene encasement has led to this type of corrosion mediation becoming the accepted industry practice for protecting ductile iron pipe. So, the question many may ask is; “Since I had such success with standard polyethylene encasement, why should I now use V-Bio Polyethylene Encasement instead?” To best answer this, it’s imperative to look at what specifically V-Bio provides that is not available with standard polyethylene encasement. The question is ostensibly meant to include “instead of other types of piping material.” Well, the reasons are vast and varies depending on project requirements. Since we aren’t talking about a specific project, we’ll look at the general overriding reasons ductile iron pipe is the best choice for your piping projects. Can McWane Ductile Provide Bonded Coatings? Can McWane Ductile provide bonded coatings? A good question recently posed and more frequently asked due to a greater recognition of potential corrosive environments. To correctly address this question, some other questions need to be answered first. If your company provides any goods or services to a governmental entity, such as the Small Business Administration (SBA), Department of Transportation (DOT), or Environmental Protection Agency (EPA), and similar state agencies and municipalities, you may be familiar with requirements to have a percentage of the work performed by Disadvantaged Business Enterprises (DBEs). Many federal, state, and local entities have passed laws and regulations to encourage the use of DBEs in government contracts. 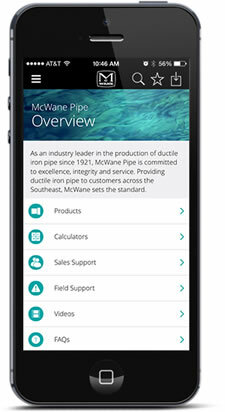 For generations, McWane Ductile has been an industry leader in the manufacture of water distribution and infrastructure products. The history of McWane Ductile, a family owned company, has beginnings dating back as early as 1871, when Charles Phillip McWane entered the foundry business in Lynchburg, Virginia, with his sons Harry and James Ransom (JR).